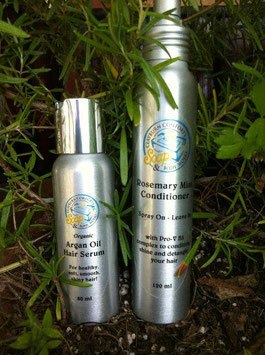 100% Organic Argan oil, Camellia oil, Jojoba oil and Sunflower oil combine to create an amazing hair serum treatment. Packed with vitamins and minerals and natural spf properties, these oils are reputed to provide the following benefits to your hair: strength, smoothness, softness, help to prevent color loss, prevent hair loss, prevent dandruff, frizz and split ends. A few drops is all you need, so expect this serum to last and last. Directions: To smooth & shine: Dispense a very small amount into hand, rub hands together to warm and apply to hair shaft. For deep care: Dispense a dime size amount into hands and warm; apply to scalp starting at base and massage through hair. Leave on for 30 minutes, then shampoo as normal. For external use only.